A few, quick news items. First, the Deerfield and Swift were stocked this past week (report here). In prior years, the numbers of fish placed for the initial stocking haven’t been huge, but, hey, they’re better than nothing. Moreover, the Swift is back down to a wade-able level from what I’ve heard from Dylan Curley, who knows well the river (thanks, Dylan!). And, Connecticut is the pace setter on getting fish out, as they usually are each year (report here). 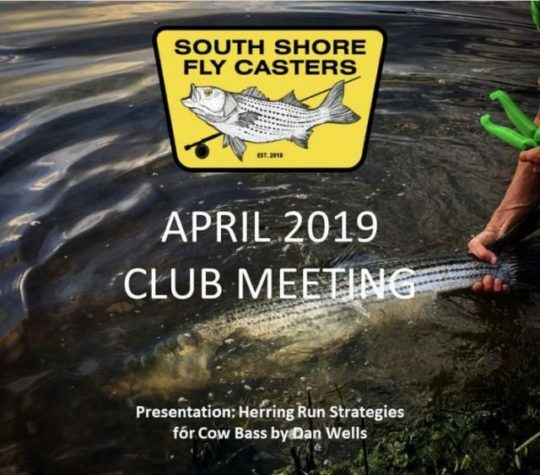 Second, fellow blog writer Dan Wells will be giving a talk on “Herring Run Strategies for Cow Bass.” It will be April 10, 8 pm to 9:30 pm, at the Weir River Estuary Center in Hull, MA. You may have read Dan’s incredibly rich and thoughtful posts on striper fishing (posts here). Don’t miss out on the chance to learn more from one of the most deeply knowledgeable anglers out there. I hope everyone is getting ready to fish!